Also known as: turtle beans (black turtle beans), black Spanish beans, Tampico beans, and Venezuelan beans. The common bean is thought to have originated in southern Mexico and Central America over 7,000 years ago. Evidence of its use has been found in excavations of prehistoric dwellings. The common bean has since spread widely around the world and black beans are widely used throughout Latin America, the Caribbean, and the southern United States (especially Florida and the Southwest). Black bean soups, stews and sauces are very common in Latin American countries. Black beans are becoming more popular in this country, in part due to increased immigration from Latin American countries, and the culinary traditions these immigrants bring with them. Black beans are small (about the size of a pea), oval and jet black. They have cream colored flesh, a mild, sweet, earthy taste, and a soft texture. Black beans grow best at temperatures between 65º and 75ºF. They are a warm season crop, requiring up to 120 days to reach maturity and dry. The beans are left on the plants to dry, so humidity and heat can cause damage to the beans as they are drying on the plant, and rain can be a problem during the drying and curing process. They are harvested by machine, and the plants themselves left as 'green manure'. Black beans are commonly packaged in 100 lb bags and 1 lb bags. They should be stored below 70ºF, in airtight containers. They can be stored for up to one year this way. 1 cup beans = 2 cups cooked. 1.5 to 2 lbs of black beans per gallon of water for soup. Before cooking, be sure to pick through them, picking out any small pebbles, split and withered beans and any other foreign matter. [Beans from the Rockies and Pacific coast tend to have more adobe (bits of clay) and stones]. It is also helpful to cover the beans with cold water, let sit for 5 minutes and remove anything that floats. Repeat to be sure all dirt and foreign matter is removed. Drain. Black beans, like all dried beans, need to be soaked before cooking. This hydration helps to reduce the cooking time. Because they are small, 2 - 4 hours soaking in cold water should suffice. Drain, and cook as per recipe. If you don't have the time, boil the beans in water for 1 - 3 minutes, turn off heat, cover the pot and let them sit for one hour. Drain and proceed as per recipe. However, there is a problem with this quick soaking (boiling for 1 - 3 minutes) method. Hot water increases the solubility of the water soluble nutrients, and softens the cell membranes of the beans, further accelerating the loss of these nutrients. This should be a consideration, because of the long cooking time during which more nutrients are lost. Cold soaked and cooked at a very gentle simmer, beans retain most of their nutrients, which are considerable. To cook, drain the soaking water and add cold water, 1 part beans to 2 or 3 parts cold water. Bring to a boil, then reduce heat to a very slow simmer, so the beans stay in their jackets. Simmer for 2 hours. All legumes are high in protein, and black beans are no exception. Dried beans are important sources of protein in vegetarian diets, and in areas where animal protein is scarce or expensive. However, this protein is incomplete (does not contain all 9 amino acids), so grains (which provide the missing amino acids) must also be a significant part of the strictly vegetarian diet. Or, small amounts of dairy products, meat, poultry or fish (which contain complete proteins) must be part of the diet. In the areas where common beans originated (Central America and southern Mexico) corn supplied the missing amino acids, and squash was an additional source of vitamins. 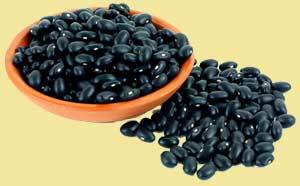 Black beans, as all dried beans, are also good sources of starches, fiber, B vitamins, iron, zinc, phosphorus, complex carbohydrates and calcium. About half of the calcium is lost during cooking. High percentages of the other nutrients remain however, even after cooking.